Ten days on the water (06-12-09 to 06-21-09). -Meet-up with Harlan Schwartz, http://www.solotripping.com/ . Harlan is on a ten day solo trip starting today, 05-30-09 and he’ll be back on June 8th. I will be staying at Harlan’s the night before I head to Leano Lake. unnamed / Haggart River ? Another option for Day 6: If I take this option, then I will need to adjust the remainder of my route. By the time I get this far I will have an idea what conditions the portages are in i.e. dead falls, my rate of travel, etc. My route is subject to change based upon unknown factors once I start my trip. There are several options to lengthen or shorten the trip. 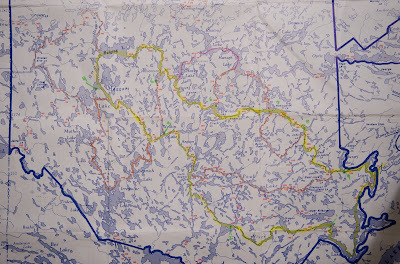 I plan to check out where some additional campsites are located off the Woodland Caribou Office map so that I can adjust my travel days based upon how I’m feeling. 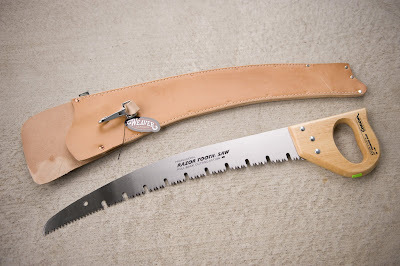 My new 21" Corona Pruning saw and scabbard arrived from Forestry Suppliers yesterday. I need to oil the scabbard before I go. I've been getting my gear ready to go on this trip. I put up the new MSR Hubba Hubba and added some guy lines and plastic inside floor liner. I've repaired the Prism. I needed to epoxy some fiberglass to the underside of the tractor seat. I also put on another layer of epoxy to the entire bottom. Today I put together the route that I think I'll take and made the itinerary. Checked the Peak One stove. I think the only thing I'm waiting on is a Granite Gear portage pack liner from Piragis. I ordered two. I have a Ostrom pack liner from last year. I thought I see what they were like. I know I've been doing other stuff to get ready for the trip the last couple days but I can't think of any thing too important at least to mention. I know I haven't written about paddling lately, but I still have been getting out. I'm up around 90 hours. Today, I went for 2 hours and 35 minutes and yesterday was 3 hours. Yes, this is a solo trip. Should be a good time. This is a new area for me. Although, I've traveled / camped in a boreal forest in the past (Wabakimi).It looks like the weather (warmer temps) will be better than what it has been the last few weeks that is if the forecast is correct. Thanks for taking the time to look at my blog!